The news reported in The New York Times today that MIT researchers have created molecular chips should resound through Korea's semiconductor industry. This development suggests that the growing power and decreasing size of semiconductors may continue to fuel the information revolution for some time to come. 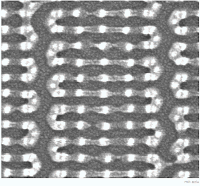 The graphic accompanying the story (click on the graphic here to see a larger version) is an actual photograph of the molecular chip developed at MIT. The researchers used a new technology called "copolymers" to allow chip manufacturers to take molecules and arrange them in complex patterns on silicon chips.